Audience: Intended for ages 8-12, but younger children may not enjoy the somewhat slow pace. However, this book is the first in a trilogy, so the book spends much time introducing the characters and setting the stage for later action. While not as dark as the Lemony Snicket series A Series of Unfortunate Events, it is darker than most writing for this age group. Summary: Henry’s loving, overprotective, and somewhat distant parents have been kidnapped in South America, so Henry is sent to live with his aunt, uncle, and three girl cousins in Henry, Kansas. Aunt Dottie is also overprotective, unsophisticated, loving, and frugal. Uncle Frank is somewhat odd (he sells tumbleweed on eBay for $700) and seems to know more than he is telling. He introduces Henry to soda, baseball, and pocket knives. Henry’s bedroom is in the attic. One night, bits of plaster fall on his head. Two knobs are protruding from the wall, and one is turning slowly. Henry and his cousin Henrietta gradually uncover and explore the mysterious cupboards. Each cupboard is linked to a different world. Some are dangerous while a few are peaceful. Some of the people Henry meets on the other side of the cupboards are glad he uncovered the cupboards, but others are furious that he did so. 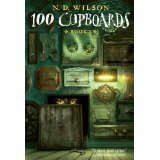 Literary Elements at work in the story: 100 Cupboards is a fantasy-adventure book. It is also the first book in a trilogy. Perspective on gender, race, culture, economics,ability: Race is not identified. Since the setting is rural Kansas, one may assume that the main characters are Caucasian. But children of any race can identify with Henry and his aunt, uncle, and cousins. In an interesting perspective on gender, Henry is the timid, hesitant, unadventurous child while his cousin Henrietta is the bold, assertive, dominating child. Theological Conversation Partners: Psalm 3, Philippians 1:27-28; Living in community, moral bravery, family. If you were opening the cupboards, what are some things or places you would like to find? Notice the repetition on names. Henry is a boy and a town. Henrietta (the feminine form of “Henry”) is his cousin. Why do you think the author used such similar names? Henry’s parents were very protective (making him ride in a car seat at age 10, not allowing him to play sports, have a knife or drink a soda). What is the difference between being protective and being overprotective? What are the benefits and the disadvantages for the child of overprotective parents? What are the benefits and disadvantages for the parent in being overprotective? How is God protective of us without being overprotective? Henry does not seem to miss his parents or worry about their disappearance. Why? Some reviewers have expressed reservations about the book based on this lack of worry by the character. Share your speculations about Henry’s feelings. The end of this book is not the end of the story of Henry’s adventures. Based on events in this book, what do you think may happen in the next book? Will Henry find his parents? What do you think Henry will learn about his family? The children in the book are curious about the cupboard and the worlds beyond. When is curiosity a good thing? When can curiosity cause trouble or be dangerous? About what are you curious? This review was written by Union Presbyterian Seminary graduate Mary Anne Welch. 100 Cupboards by Storypath is licensed under a Creative Commons Attribution-NonCommercial 4.0 International License.